I was not going to make this post because it's a little bit like posting the fried eggs you normally make yourself for breakfast. However some of my friends got interested, so I thought why not. It's not the first time that I see the simplest things getting way more resonance than something more sophisticated. After all this breakfast or snack food adds so much pleasure to your everyday life. 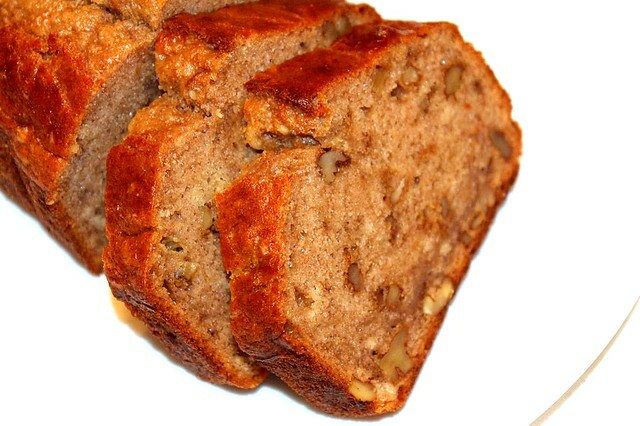 I played with this recipe for a while baking banana upside downs and banana muffins before I arrived at this simple banana bread which you can make in 15 minutes. 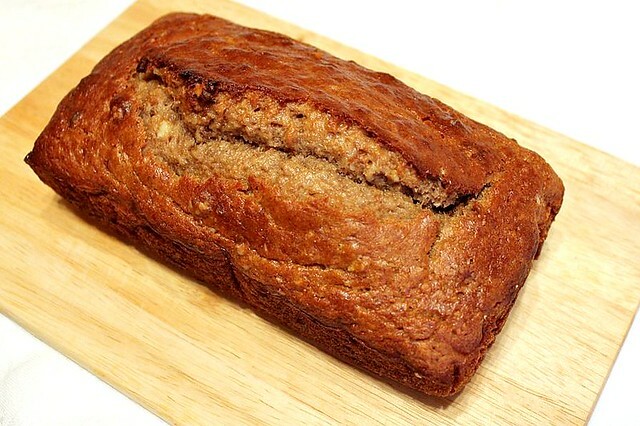 Then it bakes over around an hour and yields a healthy delicious loaf cake. It is now seriously becoming the next favorite breakfast in our family taking over leadership from oatmeal cookies, granola and (!) even cottage cheese bake we kept making for years and years. In a medium bowl combine all the dry ingredients and mix well to make sure the baking powder is spread equally. Combine the mashed bananas with soya milk and oil and mix well. Pour the banana mixture in and mix till combined. Mix in the chopped walnuts. Do not overmix the batter. It shouldn't get perfectly smooth. Just make sure the dry ingredients get wet and there are no big lumps of flour left. Line a loaf cake pan (20 by 10 cm) with foil or baking paper and slightly brush it with vegetable oil. Pour the butter into the pan and bake at 180C bake for 45-50 minutes. The ready cake should fill set on top and spongy if you press. Check the readiness with a wooden stick. It should come out clean. Take the cake out and let cool for 2-3 minutes. Take out of the pan and let cool to room temperature. It is best eaten the same day, but keeps well in a plastic bag in the fridge for 2-3 days. If you need to store it longer, it will keep in the freezer for over a week.